Widows review: "A heist movie with serious bite"
A heist movie with serious bite, Widows is both brilliantly tense and strikingly relevant. Faint incredulity greeted the news that arthouse powerhouse Steve McQueen would follow the Oscar-winning 12 Years a Slave with a remake of 1983 Brit-TV crime series Widows. What next, a big-screen Minder reboot? But transformed into this tough, topical, and unabashedly thrilling Chicago-set female heist movie, it positively explodes off the screen. McQueen’s muscular, melancholic make-over starts literally with a bang, as Harry Rawlings (Liam Neeson), his gang, and their big cash haul go up in smoke after a high-octane botched robbery. As Harry’s devastated widow Veronica (Viola Davis) essays a raw, dignified grief – one that’s inflamed by local kingpin Jamal Manning (a smoothly menacing Brian Tyree Henry) insisting on a refund-or-death deal for his stolen $2m. Owning nothing but Harry’s secret blueprint for a major robbery, the heist she proposes to her fellow widows – single mother Linda (Michelle Rodriguez) and the flaky, helpless Alice (Elizabeth Debicki) is a life-saving necessity, not a caper. The reluctant amateurs show a defiant desperation that injects some overdue realism into the genre, echoing gritty forebears such as Paul Schrader’s Blue Collar (1978) or broke girls bank-job Set it Off (1996). There’s real pleasure in watching them skill up (or screw up), while cajoling and blackmailing guns, a getaway van and vital info out of unsuspecting targets. Resolutely refusing to dumb down for the multiplex, the movie also weaves in a cynical, all-male story of Chicago corruption, as Manning battles Colin Farrell’s devious Jack Mulligan, squabbling son of Robert Duvall’s Trumpian politico, to win a lucrative election in a black-majority ward by any means necessary. Richly lensed by McQueen’s regular DoP Sean Bobbitt, the settings offer some resonant contrasts. The Mulligans’ lavishly antique Old Chicago offices clash with Veronica’s stark glass penthouse and the widows’ dark shabby warehouse HQ. Meanwhile, Mulligan Jr.’s limo glides through neighbourhoods beset by peeling poverty en route to his gentrified fortress. Tightening like a noose around both plots are the escalating suspicions of Jatemme (Daniel Kaluuya), Manning’s psychotic enforcer. Committing a shocking act of brutality in a bowling lane (“This is like that Operation game”), or forcing a terrified freestyle rap from victims, he’s proof that McQueen can muster sphincter-tightening gangland menace as well as heavyweight themes. That said, there’s some fascinating overlap with Hunger and 12 Years a Slave in the gal-gang’s stubborn refusal to submit. As Linda puts it: “I want my kids to know I did something. 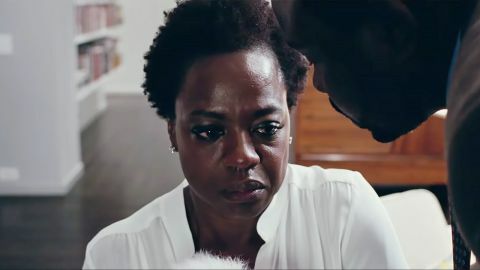 Didn’t just sit there and take it.” There’s shared ground with Shame, too, in Viola Davis’ powerful portrait of sustained suffering, dogged by knife-sharp flashbacks of loving Harry. Pole-axed by sorrow, scared, angry, and vengeful, Davis is the film’s motor. It’s Veronica’s guts and gravitas that push the women’s scrappy scheme on; their secret weapon the fact that “no one thinks we have the balls to pull it off”. But the biggest surprise is Debicki, digging courage and ingenuity from battered Alice by masquerading as a mail-order bride to grab Glocks and other vital assets. Rodriguez shows a tenderness untapped in the Fast and Furious series, while Cynthia Erivo’s late-recruited getaway driver Belle flaunts a quiet toughness that lets her go toe-to-toe with Davis. Characters this well drawn take time, however. The film’s panorama of grief and grift is sprawling and absorbing, rather than swift-footed. It’s lightened by co-writer Gillian Flynn’s (Gone Girl, Sharp Objects) trademark grit and dark humour, novel stuff in McQueen’s often punishing work. Indeed, there’s a Black Lives Matter-style tragedy sprung here that has sharp emotional recoil. But after a midpoint gut-punch, revenge gives a booster rocket to the film’s back half. Hans Zimmer’s thrumming score steps up the pace, as the visceral tension of the robbery run-up starts to bite. Clumsy, violent, and threatened by rookie errors, the heist is the polar opposite of Ocean’s 8’s slick jigsaw puzzle of a job, heightened by the widows’ desperation. Circling plots collide in kinetic car chases and bloody pay-offs, all favouring rough justice over sleek ingenuity. It leads to a searing showdown that’s studded with loss and Davis’ badass determination. If McQueen fans miss the lyrical, piercing depth of his earlier work, there’s an echo of it in the quartet’s faint, flawed nobility. Empowering and engrossing, with a cynical eye and a social conscience that adds heft and heart to the heist, it’s a hugely accomplished and enjoyable addition to McQueen’s oeuvre.